Junior boxers Aditya Maan (66kg) and Ashish (63kg) powered through to the quarter-finals of the AIBA Junior World Boxing Championships in Kiev, Ukraine. 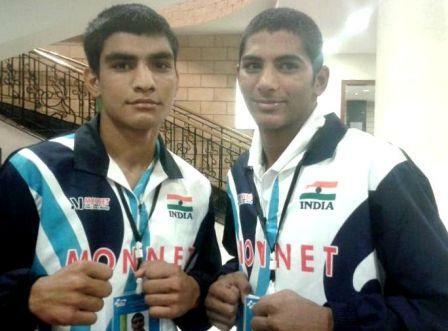 The young Indian pugilists put in a scintillating performance to overhaul their respective opponents and make place in the round of 8 on Wednesday (11 Sep 2013); both the boxers are now one step away from securing a WC medal. But it was disappointment for 2013 Junior Asian Championship bronze medallist Vishnu Dayanand Chayal (57kg) – the third Indian to have made a place in the pre-quarters of the championship – as he came agonisingly close to grabbing the quarter-final spot. Maan, also a bronze medal winner at the Junior Continental Championships earlier this year, made his place in the pre-quarters beating Hungarian boxer Laszlo Kozak in what was a close contest. In the round of 16, up against Javier Estrada from USA, Maan made a strong start, taking the fight to the American. The Indian gained a clear advantage and put Estrada on the back foot owing to some cracking straight punches. He did not allow his opponent to come close through the entire bout and went on to win by virtue of a unanimous decision. In the quarters he will lock horns with Cassio Olivera Santos from Brazil. In the light welter weight division Ashish, playing his very first international tournament, created a flutter in his opening round bout as he got rid of Marcel Rumpler from Austria in the second round wining by virtue of a RSC OC decision (Referee Stopped Contest – Outclassed). In the pre-quarter finals, the 15 year old boxer from Chandigarh once again gave a good account of his boxing skills as he plundered to a unanimous victory against Jegors Artjomovs of Latvia. In the quarter-finals he will take on Shabbos Negmatulloev of Tajikistan. In the feather weight category Vishnu’s World Championship campaign came to an end at the hands of English boxer Dalton Smith. But the 16 year old Indian put up strong show against some quality boxing from the Brit, in the end though he lost by just one point. Earlier in the competition, in what was an upset for the Indian Camp, reigning Asian light weight Champion Prayag Chauhan (60kg) lost his opening round bout to Muzaffar Rashidov from Uzbekistan. In the light fly weight division Gaurav Solanki also lost in the opening round against Han Younghun of Korea.